A pulse with width comparable to that of the oscillator, yet with 105-106 times the energy, can be obtained with Yb:SSO CPA amplifier system. Researchers in Prof. Xiaoyan Liang's group, from Shanghai Institute of Optics and Fine Mechanics, Chinese Academy of Sciences, have conducted series of experiments on the CW and CWML oscillators based on Yb:SSO, and for the first time to the best of our knowledge, applied this crystal into the chirped pulse amplifier (CPA) to explore its potential as good amplification medium. Eventually, a pulse with width comparable to that of the oscillator, yet with 105-106 times the energy, was obtained. It is reported in Chinese Optics Letters Vol.13, No.1 (2015). Yb-doped silicate Yb3+:Sc2SiO5 (Yb:SSO) has some excellent crystalline features such as broad gain bandwidth, high emission cross sections and thermal conductivity. These features indicate a potential use of Yb:SSO in the development of high average power continuous wave (CW) and ultrafast continuous wave mode-locked (CWML) lasers. A number of studies have been reported on Yb:SSO oscillators, including CW and CWML operation, over the last few years. Nevertheless, its capability of energy amplification has not been investigated. 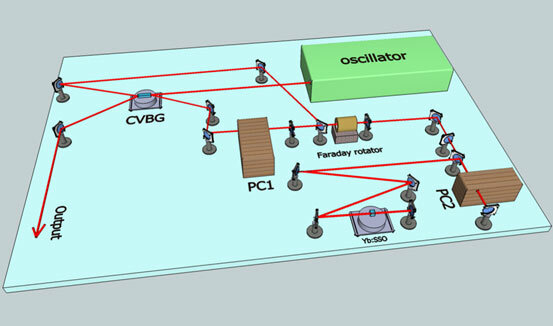 In the study, a self-made femtosecond oscillator is used as the seed source. And a single chirped volume bragg grating (CVBG), with simpler structure and easier alignment compared with traditional grating, is used as both stretcher and compressor, which makes the whole system more compact. Researchers from Prof. Liang's group believe that the result of this study confirms that Yb:SSO has great potential as CPA medium. Regenerative amplifiers based on this material could have important application in industry, medical and scientific areas such as micro-machining, biological imaging, microsurgery and nonlinear spectroscopy. In the future work, effective measures need to be taken to suppress the gain narrowing effect in CPA, so that output pulses with shorter duration can be obtained. Moreover, in this way, a variety of insertion loss can be effectively attenuated to improve the amplification efficiency.